5' wide more stable on the water, Foam filled, virtually indestructible. We’ve been handling floating docks for eight years. When we started, because it’s floating dock, we thought the market was for lakes with bad or deep bottoms where ordinary pipe piers wouldn’t work. 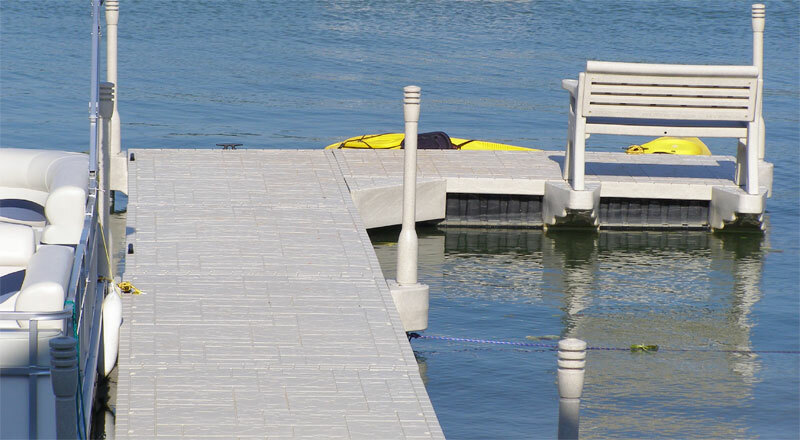 We’ve come to realize that because of the beauty and durability of the our floating dock it’s being installed where a floating dock isn’t “necessary”, but in applications where people want a unique dock with features. With the options and accessories available, there really isn’t anything like it. Aesthetically pleasing, it seamlessly blends together with no odd color connectors or parts. Options like lower step-down and kayak/canoe rack, ramps and V’s allow almost any installation that you can dream up. Individual pieces of dock lock together with our unique H beam on the ends or sides of the dock sections. Wave action or rough use has no effect on the dock. Fasten the dock to the bottom with dock pipe anywhere along the dock where you can find a good bottom. You only need posts about every 20’. 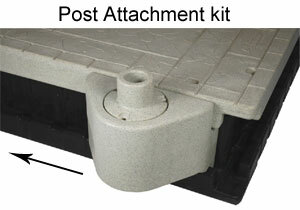 Attachment kit can slide along the length of the dock until you find a good bottom for mooring. 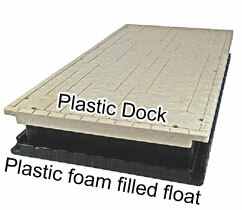 Dock Sections are 10' (120") x 5' (60"). Example pricing below for dock package above.